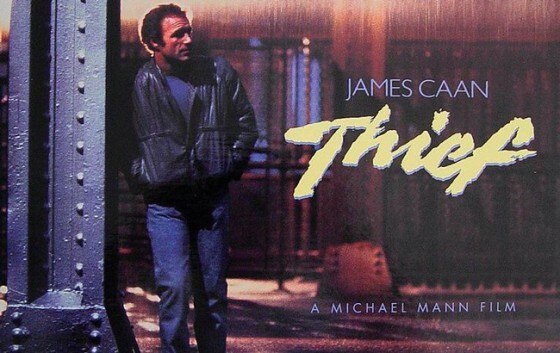 Thief, Michael Mann's 1981 directorial debut was originally known as Violent Streets, why I'm not sure as Thief is the perfect, to the point title for the movie, rather than that horribly generic alternative. 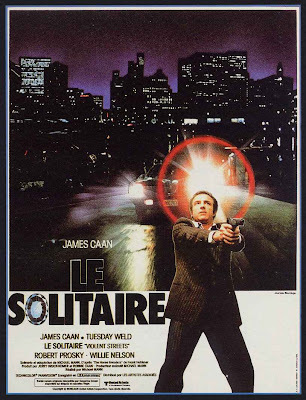 Based on Frank Hohimer's novel The Home Invaders, Thief is perhaps one of the most under appreciated films of the 1980's. Frank (James Caan) is the titular Thief, an expert safe cracker, hiding behind the cover of two legit businesses (a used car lot and a bar), he and his team pull diamond jobs as and when they need to. When Frank is introduced to Leo (Robert Prosky), the usually defiantly independent and guarded thief is seduced into working for him, seeing this as a chance of a way out for himself and wife Jessie (Tuesday Weld) into his long cherished, collage version of the American dream. One huge score for Leo and he's out of the thief game for good, but when are things ever that simple? As with most Michael Mann films, Thief centres on the professionalism and skill at his job of the lead character, and on how this often leaves little room left in their life for anything else. Mann effortlessly introduces Frank's ability as an expert safe cracker in a superbly executed diamond robbery at the beginning of the film, as mesmerising a piece of cinema as you could wish to see. As the film progresses the icy cool of Frank at work is juxtaposed with the other less successful facets of his life away from the cold metal of a safe door. Alternately needy and childlike one moment to a hot headed thug the next, with the professional somewhere inbetween, it's a fantastically nuanced performance from Caan adding serious weight to what on the surface appears to be a simple crime thriller. Willie Nelson, has a small but pivotal part as Okla, a father figure who taught Frank everything he knows. When he disappears from the film, Leo ruthlessly exploits the hole left behind, Prosky who is probably best known for his role in Hill Street Blues is superb as the manipulative gangster, who turns violent when pushed. Tuesday Weld is also really good in a difficult part as Jessie, Frank's girlfriend/wife and they share an electric scene in a diner where Frank explains his life to her. The supporting cast is filled with good performances, all creating a fleshed out and believable world with a solid James Belushi in an early role and a shamefully underused Dennis Farina also popping up. Technically the film is stunning, the photography by Donald Thorin is simply gorgeous, as is usually the case with a cinema stylist like Michael Mann. It's easy to see how Thief influenced Nicolas Winding Refn's recent Drive. Not only in it's photography but also in it's soundtrack, an amazing pulsating synth score from Tangerine Dream that propels the film. While looking up to see if Caan received an Oscar nomination for Thief (He didn't but really should have done), I noticed the film was nominated for a Razzie for worst score, which just seems unbelievable to me. The heist scenes are truly impressive, with every detail researched to achieve a level of realism unseen in movies before and probably since, with a measured pace to allow the viewer to soak up all the detail. 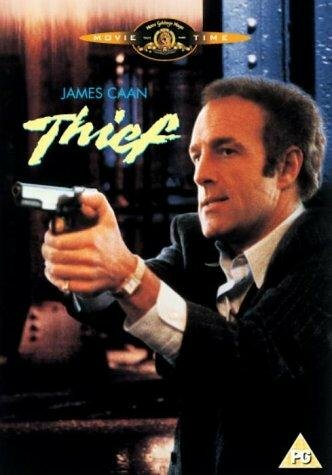 Thief, has a distinctly 1970's flavour to it's story and characters, which is a huge compliment given the legacy of quality in crime films from that decade. Importantly though it also has a feeling of futurism, purely in filmmaking technique with Mann's style immediately apparent from the opening moments of the film. I saw Thief on the recent region 2 Optimum dvd release, a dvd with a couple of issues. The dvd had a few video glitches, nothing serious but nevertheless noticeable and more problematically the dvd has sound level issues where the dialogue is drowned out by the score and foley effects. This may have been how the film was mixed originally but it required remixing for home viewing, as I had to keeping raising and lowering the volume from scene to scene, not conducive to a great viewing experience. 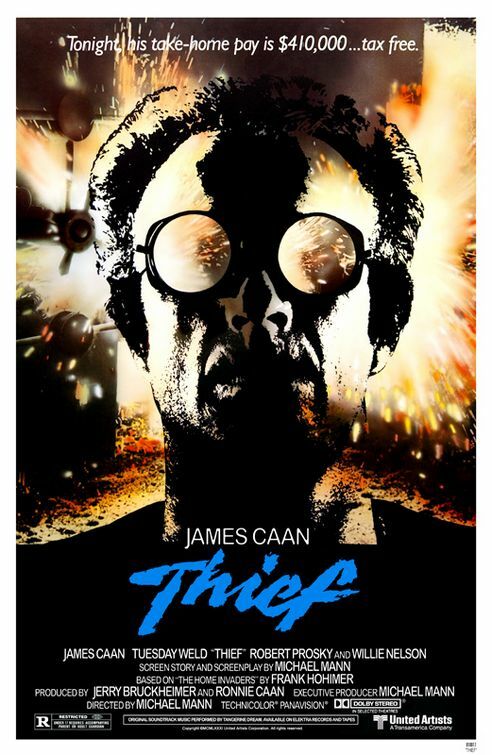 Despite the presentation issues with the dvd, Thief has immediately become a firm favourite of mine, with Caan's best ever performance lifting an already exciting and occasionally shockingly violent crime movie up into the upper echelons of it's crowded genre. I simply cannot recommend Thief highly enough. Nice write-up! And I share your love of DRIVE. Thanks John, I really appreciate it. I expect Drive to be my pick of this years movies and Thief to be near the top of a list of films I've seen for the first time this year. Great write-up! Thief is a classic. James Caan at his best! Thanks Ty, Caan is just awesome in Thief. Just browsing old old posts. Dont' mind me. Out of curiosity, did you pick up Arrow or Criterion's new version? I have picked up the Arrow limited edition with the original colour grading, but have yet to watch either version! I picked up the Criterion when it was released, but never got around to watching it, so when the Arrow was announced I moved the Criterion on. The Arrow release is superb.